Lash Lift is a treatment that lifts your natural eyelashes from the root, creating the illusion of length and curl that lasts up to 6-8 weeks depending on home care, eyelash growth, and even with activities such as swimming or daily showering. Natural lashes are carefully glued onto pads which are placed on the eyelid with a water-soluble glue. Then, we apply a series of different solutions to achieve the lifting effect. The entire process takes an hour, and all that is required after is that you keep your lashes dry and free from oil and steam for 24 hours. An individual who has HEALTHY, STRONG EYELASHES, but who is happy with the length and thickness of their own natural lashes, but wants a more noticeable open, curled look to their eyelashes. Lash Tinting is a 30-minute procedure in which the eyelashes are dyed from root to tip, resulting in a darker appearance. The gentle plant-based dye is applied with a small disposable brush, removed shortly after with a soft compress. Your eyes are closed the entire time, and you should feel zero irritation. After the dye is applied relax and drift away while listening to spa music. 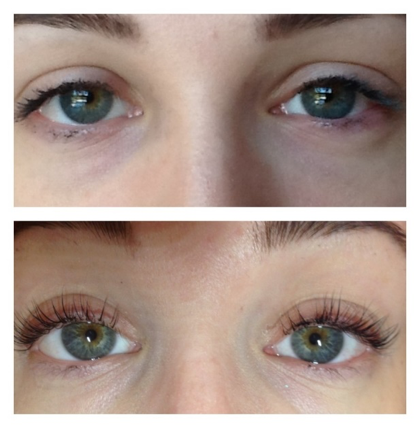 Eyelash and eyebrow tint can last from 2-4 weeks, slowly reducing over time. Most maintain a tint every 3 weeks. Due to the nature of individual hair growth and health, we cannot predict the precise outcome of the "Lift and Tint" procedure. This procedure is not intended to add LENGTH to lashes. It curls and dyes your natural lash. If your lashes are not healthy or long enough, you may not be a good candidate for this service. Your technician will discuss alternative options if we determine that Lift and Perm is not a good fit for you. We do guarantee we will provide consistent, quality care, using highly rated quality products. Because we stand behind our work, if you are not happy with your results at any time within the first 48hrs, please contact us immediately to discuss options. We will be happy to repeat the service, offer alternative services, or refund your money. BRINGING OUT THE BEAUTY IN YOU is our passion. Thank you for allowing epo to serve you.